Laryngitis is the inflammation and irritation of the larynx, or voice box, and the surrounding tissue. Swelling in this region causes your voice to sound abnormal and hoarse. It may be accompanied by a dry cough, inability to speak, rawness and the need to clear your throat. The cause is usually a virus and the condition is rarely serious in adults. Chronic laryngitis may result from heavy smoking or drinking or gastroesophageal reflux disease. A study published in the "Archives of Pediatric and Adolescent Medicine" reports that a single nighttime dose of buckwheat honey was given to children ages 2 to 18 years suffering from upper respiratory tract infections. The honey was superior to placebo in improving cough frequency, cough severity and child and parent sleep quality. In addition, the honey treatment was as effective as dextromethorphan, a common over-the-counter cough medication. There is little scientific work testing the effectiveness of chamomile tea for laryngitis. One study published in the "Journal of Herbal Pharmacotherapy" found that a tea consisting of chamomile plus seven other herbs is more effective than a placebo tea in reducing sleep discomfort, cough frequency and cough intensity in patients with allergic asthma. The Mayo Clinic notes that any warm, decaffeinated tea should help soothe your sore throat and reduce symptoms of laryngitis. Honey should never been given to infants under 1 year old, because of the risk of life-threatening infant botulism. 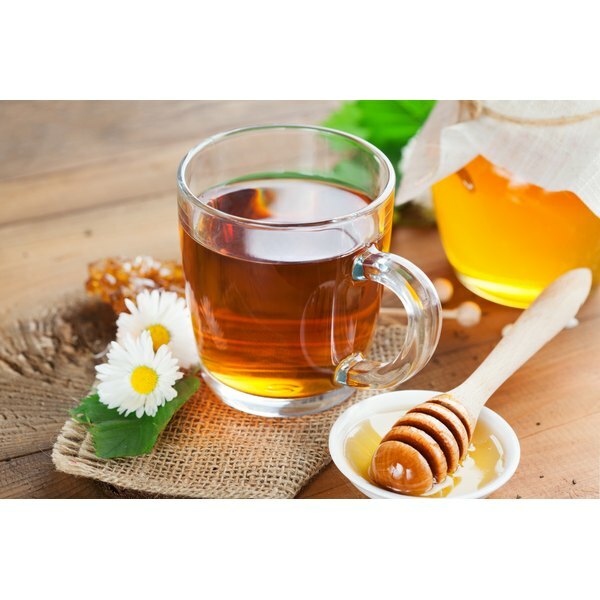 However, for older children and adults, honey is a well-tolerated and safe alternative to medications. The World Health Organization recommends the use of honey for the relief of cough and cold symptoms. The American Association of Pediatrics does not recommend the use of over-the-counter cough medicines for children. Honey is a safe and effective alternative. Laryngitis is commonly caused by a virus, and antibiotics are therefore not effective. So treatment is aimed at reducing the symptoms. Try to rest your voice and avoid the use of tobacco or alcohol. Prevent a dry throat by using cough drops. Inhale steam via a humidifier or hot shower, and gargle several times per day with 1/2 tsp. of salt in a glass of warm water.